Police outnumbered protesters along West Florissant Avenue in Ferguson on Tuesday night, perhaps signaling the demonstrations around the anniversary of Michael Brown’s death are starting to fade. The crowd of around 100 demonstrators was mostly calm and peaceful. Occasionally a few people would march or start a chant, but they spent most of several hours milling around and chatting with one another. Larry Miller, 58, organizer of the protest group Ferguson Freedom Fighters, said it was clear the latest round of demonstrations were dying down. He wasn’t convinced much was accomplished. A tense moment Tuesday came when a couple dozen people briefly blocked traffic. But several officers in riot gear, along with St. Louis County Police Chief Jon Belmar, quickly moved to break it up. Police said they made no arrests. Overall, it was a far cry from the violence and tension that marred the previous two nights. 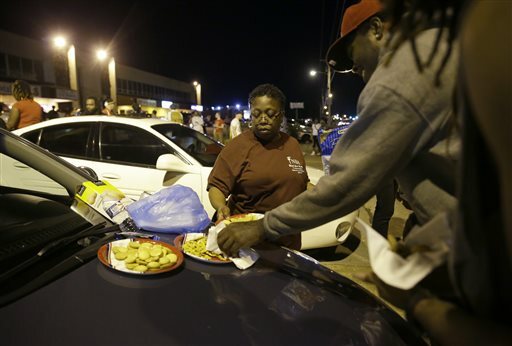 The St. Louis suburb has seen demonstrations for days marking the anniversary of Brown’s killing on Aug. 9, 2014. Brown, 18, was fatally shot by former Ferguson officer Darren Wilson after a confrontation. A St. Louis County grand jury and the U.S. Department of Justice cleared Wilson, but Brown’s death spurred a national “Black Lives Matter” movement. The events had largely been peaceful until Sunday night, when gunfire erupted and 18-year-old Tyrone Harris Jr. was shot by officers after they say he fired into an unmarked police van. Harris is hospitalized in critical condition and has been charged with 10 felonies. The gunfire and Harris’ shooting set the city on edge and had protest leaders worried that tensions would escalate. The St. Louis County executive declared a state of emergency Monday, a move that gave Belmar — instead of interim Ferguson Police Chief Andre Anderson — control of security. On Monday night, the police presence was far greater. Officers lined several blocks of West Florissant, rather than staying confined to a smaller area. Unlike Sunday, there was no gunfire, no injuries and no reports of looting or property damage. By Tuesday night, there was far less tension. Police said in a statement that at one point, officers reported rocks being thrown at them. They took no action, and the rock-throwing soon stopped, according to the statement. Even when armed members of the Oath Keepers, a far-right anti-government activist group whose presence Belmar has called “both unnecessary and inflammatory,” appeared, there was little conflict. While one member was being interviewed by media, several protesters gathered around and chanted loud enough to drown him out briefly. Later, several Oath Keepers and protesters began arguing, but eventually shouting gave way to conversation, and the group parted ways with a pat on the back. County Executive Steve Stenger said the state of emergency could be lifted as soon as Wednesday. Associated Press writers Jim Suhr and Alan Scher Zagier and video journalist John Mone contributed to this report.